With Microsoft Operating System, the Copy Paste function is really one of the most useful functions. Now you can automate copy and paste with the software presented here. The Software is named as Auto Mouse Clicker and is offered by MurGee.com on a free to try basis. Copy Paste can be done using Keyboard or with Mouse. Now the Software presented here can automate copy paste functions so that the task can be speeded up and can save you lots of time. Whether you wish to automate copy paste functions in excel spreadsheet or a word document, the basic idea is to click on appropriate menu or press Ctrl + C and Ctrl + V. Now you can create a macro script to automate copy and paste functions and even switch betwen applications using Alt + Tab or any other keyboard function. When automating copy and paste using mouse click, you need to be sure that the screen resolution remains the same and is not changed when recording the macro or script and playing the macro script. 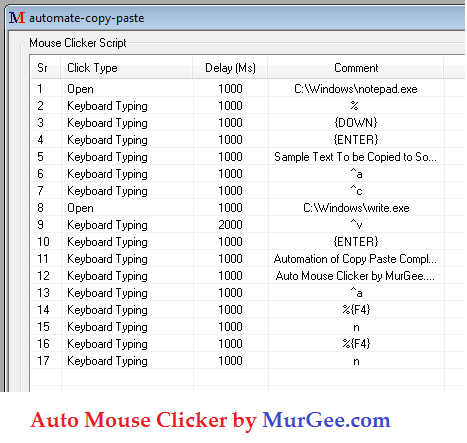 Download the Auto Mouse Clicker Software and when you first run it, it will display you a help document containing screenshots and video tutorials showing how you can get your automated copy paste running up in no time. The Software is multilingual and hence you can automate documents of any type, automate any type of mouse click, automate keyboard keys such as Ctrl + C, Ctrl + V, Up Arraw Key or any other key of keyboard. Visit MurGee.com to download and try Mouse & Keyboard Automation Software Utilities / Applications for Windows. Auto Typer to type long text onto any application or pogram with configurable shortcut key combinations. All the software downloads presented here are provided on try and buy basis. There are no reminders or nagging screens in any of the clicker Software Applications presented here. The Software downloads are fully functional with a time limit. Click on any of the Software's screenshot to know more and download the selected Mouse Clicker software. Write to suggest@murgee.com to get the best keyboard, mouse or window automation software according to your need. Write one or two lines about what exactly you want the software to do and we will send you the appropriate software download link and tutorial (video, screenshots and text).